There will be full street closures at three different Crenshaw Boulevard locations taking place this weekend. The closures are required for support-pile installation on Crenshaw/LAX Line underground stations. 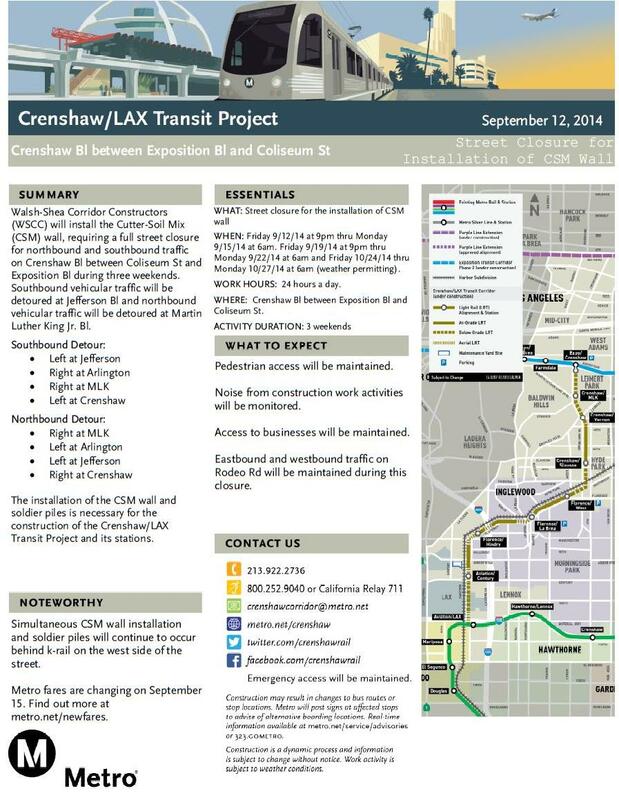 Crenshaw/Vernon Station: 9 p.m. Friday, Sept. 12 to 1 p.m. Saturday, Sept. 13. Full street closure of Crenshaw Boulevard between Stocker Street and Vernon Avenue to implement new traffic reconfiguration and begin pile installation on west side of Crenshaw Blvd. Crenshaw/MLK Station: 9 p.m. Saturday, Sept. 13 to 1 p.m. Sunday, Sept. 14. Full street closure on Crenshaw Blvd. between Martin Luther King Jr. Boulevard and Stocker St. to relocate work zone from the east side to west side of Crenshaw Blvd. Crenshaw/Expo Station: 9 p.m. Friday. Sept. 12 to 6 a.m. Monday, Sept. 15. * Full street closure of Crenshaw Blvd. between Exposition Boulevard and Coliseum Street to complete pile installation and begin excavation of underground station. *Crenshaw/Expo Station construction will also require closures 9 p.m. Friday, Sept. 19 until 6 a.m. Monday, Sept, 22, and 9 p.m. Friday, Oct. 24, until 6 a.m. Monday, Oct. 27. Keep reading after the jump for detour information.